Oxford, Maine - Alan Tardiff of Lyman drove to a convincing victory in Saturday night's Budweiser Championship Series Super Late Model main event at Oxford Plains Speedway. Tardiff has come out of the blocks impressively this season, holding an early-season advantage in the championship points standings at the historic Route 26 oval track. He outgunned fellow front row starter Andy Saunders of Ellsworth at the start of the 50-lap race and was never headed. Glen Luce of Turner chased Tardiff under the checkered flag. Luce, the 2015 Oxford 250 champion, started the race from 13th position, winning a late battle for runner-up honors with former track champion Shawn Martin, also from Turner. Saunders ended up in fourth position, with the top five filled out by Lonnie Sommerville of Barnesville, New Brunswick, Canada. Travis Stearns of Auburn won a 12-lap heat race, as did Saunders and Sommerville. Bryce Mains of Naples bounced back from a bad week with a 30-lap victory in the Allen's Coffee Flavored Brandy Street Stock race. Mains had to turn back a late challenge from the current leader in the championship standing, Billy Childs of Leeds, to claim victory. Tyler King of Livermore nailed down a third-place finish after a couple of Late-race restarts helped his cause. Rick Spaulding of Lisbon had a much stronger run than his fourth-place finish would indicate. Tyson Jordan of Oxford made his first appearance of the season and ended up with a fifth-place finish. Mains and Childs won the Allen's Coffee Flavored Brandy Street Stock heat races. 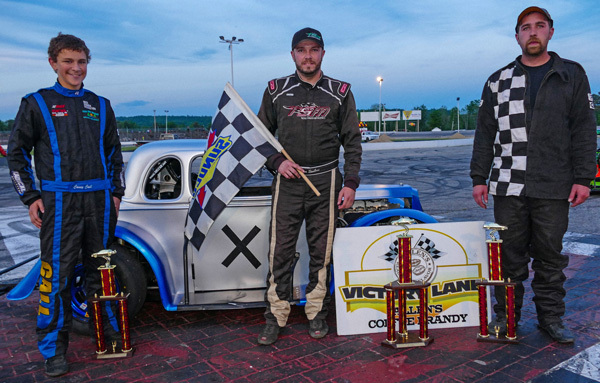 Trevor Sanborn of East Parsonsfield charged from the back of the starting lineup into victory lane in the 25-lap INEX Legends Cars main event. Sanborn got by Casey Call of Pembroke, New Hampshire to get the race lead, and then held off Buckfield's Chris Burgess to post the victory. Call was third across the finish line, followed by Thomas Everson of Gilmanton, New Hampshire and Poland's Peter Craig. Sanborn also won the heat race for Legends Cars. Brandon Varney of Auburn led all of the way to win a closely-contested, 20-lap Bandits division main event. Varney, who had wrecked his own car the previous week, borrowed an old car owned by Oxford's Chachi Hall and held off all challengers throughout the evening. Adam Sanborn of West Paris provided pressure to the leader throughout the race and crossed the line in second position. Waterford's Bill Grover was the third-place finisher, just ahead of a hard-charging Tyler Green of Turner. Hall, who provided Varney's winning mount, picked up a fifth-place finish and moved to the top of the championship points standings for the Bandits division. Rob Crepeau of Minot and Varney won the heat races. 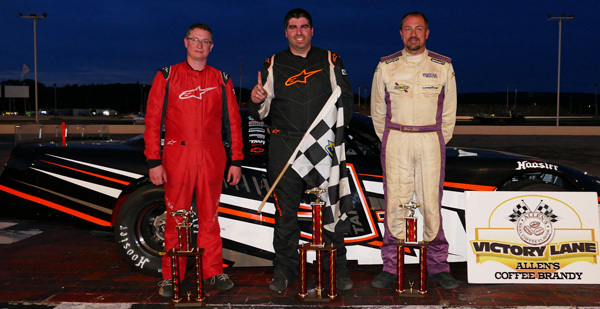 Eric Hodgkins of Minot raced to his first victory of the season in the 15-lap Figure 8 race. Hodgkins led the entire distance, and was just able to hold off points leader Tommy Tompkins of Carthage under the checkered flag. OPS Figure 8 legend David Smith of South Paris earned the third-place trophy. Kyle Kilgore of South Paris and Lisbon's Dale Lawrence rounded out the top five. The Budweiser Championship Series continues Saturday, June 17 at 7:00 p.m., with Wicked Good Vintage Race Cars joining the weekly Budweiser Championship Series classes. Oxford Plains Speedway is located at 877 Main Street, on State Route 26 in Oxford, Maine. For more information, please visit oxfordplains.com or call (207) 539-8865. Super Late Model (50 laps) 1 9 Alan Tardiff, Lyman; 2 7 Glen Luce, Turner; 3 94 Shwn Martin, Turner; 4 01 Andy Saunders, Ellsworth; 5 2 Lonnie Sommerville, Burnsville, NB; 6 27 Wayne Helliwell, Jr., Dover, NH; 7 61 TJ Brackett, Buckfield; 8 09 Daren Ripley, Warren; 9 12 Derek Griffuth, Hudson, NH; 10 16 Travis Stearns, Auburn; 11 60 Tim Brackett, Buckfield; 12 14 Scott McDaniel, Livermore; 13 97 John Flemming, Halifax, NS; 14 53 Alan Wilson, Hebron; 15 2 Chad Dow, Pittsfield; 16 26 Sammy Gooden, Whitefield, NH; 17 8 Calvin Rose, Jr., Turner; 18 51 Eddie Fatscher, East Northport, NY; 19 10 Kyle DeSouza, East Providence, RI; 20 44 Kyle Treadwell, Buckfield; 21 12 Joseph Graf, Manwah, NJ; 22 9 JT Thurlow, Windham; 23 71 Gary Drew, Casco. 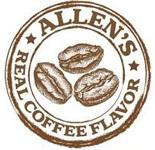 Allen's Coffee Flavored Brandy Street Stock (30 laps) 1 77 Bryce Mains, Bridgton; 2 1 Billy Childs, Jr., Leeds; 3 11 Tyler King, Livermore; 4 36 Richard Spaulding, Lisbon; 5 41 Tyson Jordan, Oxford; 6 58 David Whittier, West Poland; 7 5 Shawn Knight, South Paris; 8 4 Jordan Russell, Norway; 9 61 Matt Dufault, Turner; 10 27 Patrick Thorne, Standish; 11 14 Anthony Constantino, Sumner; 12 2 John White III, Turner. Legends Cars (25 laps) 1 X Trevor Sanborn, East Parsonsfield; 2 47 Chris Burgess, Buckfield; 3 90 Casey Call, Pembroke, NH; 4 4 Thomas Everson, Glimanton, NH; 4 4 Peter Craig, Poland; 567 Zac Godbout, Mount Vernon; 7 08 Chris Gither; 8 14 Aliyah Neale, South Royalston, MA; 9 29 Austin Teras, Windham. Bandits (20 laps) 1 1 Brandon Varney, Auburn; 2 51 Adam Sanborn, West Paris; 3 13 Bill Grover, Waterford; 4 26 Tyler Green, Turner; 5 3 Chachi Hall, Oxford; 6 77 Rob Crepeau, Minot; 7 5 Jake Hall, Oxford; 8 36 Scott Jordan, Auburn; 9 04 Tyler Jalbert, Auburn; 10 14 Adam O'Neil, Lewiston; 11 68 Eric Parlin, Mechanic Falls; 12 24 Travis Verrill, South Paris; 13 53 Chad Wills, Oxford; 14 55 Dean Jordan, Jay; 15 18 Brian Hiscock, Turner; 16 56 Addie McDaniel, Bridgton; 17 49 Jacob Dobson, Hartford; 18 2 Shaun Hinkley, Oxford; 19 71 Chris Foster, Lisbon; 20 95 Eric Stoddard, South Paris; 21 39 Randy Henderson, Buckfield; 22 91 Jamie Heath, Waterford; 23 08 Michael McKinney, Berlin, NH. Figure 8 (15 laps) 1 97 Eric Hodgkins, Minot; 2 113 Tommy Tompkins, Carthage; 3 54 David Smith, South Paris; 4 4 Kyle Kilgore, South Paris; 5 2 Dale Lawrence, Lisbon; 6 41 Greg Durgin, South Paris; 7 07 Kyle Glover, Oxford; 8 40 Robert Morey, Lisbon.